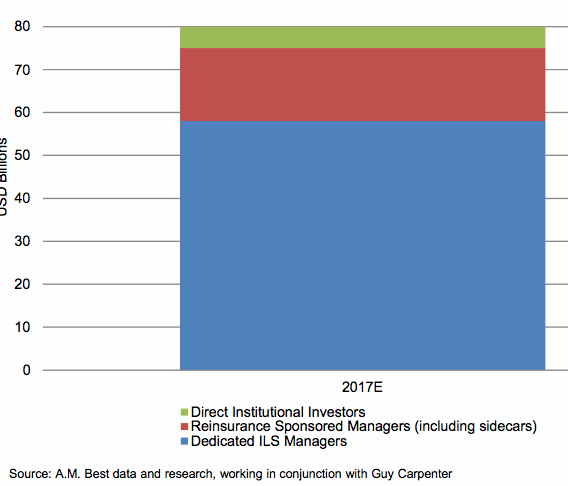 The amount of convergence capacity in reinsurance, so the capital in insurance-linked securities (ILS) funds, reinsurer sponsored third-party capital vehicles such as sidecars and from direct institutional investors, continues to grow but the pace of growth has been slowing, according to A.M. Best. 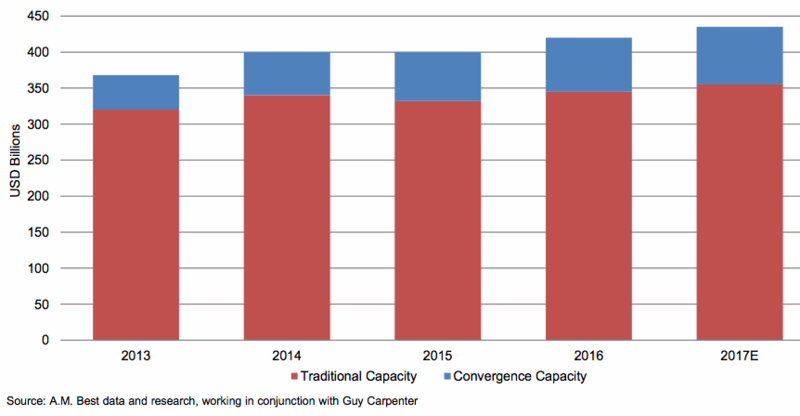 The growth of convergence capacity slowed to roughly 10% in 2016, according to A.M. Best and reinsurance broker Guy Carpenter, and looks set to slow a little further in 2017, with their estimates suggesting a growth rate of around 6% this year. A.M. Best explains why growth in convergence or ILS capacity is still being seen, despite the deteriorating reinsurance market fundamentals. “The simple answer is that property catastrophe reinsurance is viewed as a non-correlating asset class to a broadly diversi ed investment portfolio for many pension plans, endowments, hedge funds, and alternative asset managers,” the rating agency said. The growth of convergence capacity is one of the key factors that has pressurised the reinsurance market, particularly in U.S. property catastrophe risks. With traditional reinsurance capital also estimated to have risen in 2017 the pressure on pricing is unlikely to relent, for the moment, however the active hurricane season could have an impact if storms like Irma remain on their course to threaten the United States. Reinsurers and insurers, meanwhile, continue to see managing third-party capital in order to generate fee income as a viable strategy in the soft market, helping them to add efficiency to their own capacity and generate some margin out of business they can perhaps no longer afford to underwrite themselves. “But we believe the reinsurance companies have a rather natural fit here as they have the most expertise and understand the nuances of underwriting risk,” the rating agency continues. However third-party capital enters the reinsurance sector, A.M. Best says there are meaningful opportunities for the investors behind it over the intermediate and longer-terms. The dedicated ILS fund managers continue to be the major conduit for third-party capital into reinsurance, commanding the lion’s share of the convergence capital market in reinsurance. As the ILS market grows and expands its remit profiting from reinsurance will become even more attractive for third-party investors, as they find an increasingly broad pool of opportunity and increased chances for adding diversification to their portfolios. In time that could help ILS funds and investors to begin to use diversification more within their competitive tool-set, much like the major global reinsurers do today in some zones around the world. That could heighten the level of competition once again, providing renewed opportunities for ILS market growth and further expansion of convergence capital in reinsurance. Additionally, following the major catastrophe events of recent weeks, demand for reinsurance capacity may grow and the fastest to reload may find their ability to deploy capital enhanced. This could benefit some of the larger ILS funds and third-party capital vehicles of reinsurance firms, resulting in an acceleration in the growth of ILS capital again.